Coffee! How can you survive without your coffee when you travel abroad? Well, Barcelona is not in Italy, but coffee is still a strong part of the local life and you need to know how and what to order or you might get something totally different than what you expected! Learn here everything you need to know to get your favourite coffee in Barcelona without driving your waiter crazy! In Spain we are peaky about the name we give to our coffee, so beware: if you ask for a coffee (or try to translate it as a “café”), you are very likely to get a small cup of strong coffee and no milk (expresso like). We also call it “expresso” and “café solo” or “solo”. If you wish to have a large black coffee, then you need to order an “americano”. In Spain we don’t assume you need milk with your coffee, as it’s custom in other countries. So if you need milk, you’ll have to ask for it. Order “café con leche” (or “cafè amb llet”, if you want to practice your Catalan). Most waiters will also understand if you say “coffee with milk” in English, or “café au lait” in French, or even “latte” in Italian. Cappuccino, foamier than a regular coffee with milk, is also relatively easy to find in most cafés of the city center and tourist areas. 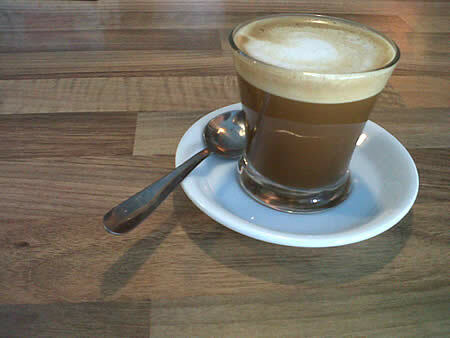 You might also see locals ordering smaller cups of coffee with milk: it’s a “cortado” (or “tallat” in Catalan). Similar amount of coffee as in an expresso, but usually served In a small glass instead of a china cup. 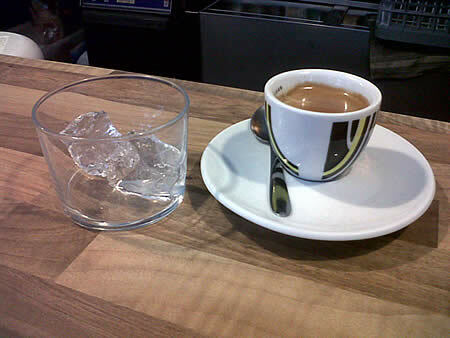 A summer must: “café con hielo” (or “cafè amb gel” in Catalan), is a slightly longer expresso accompanied by a glass with a couple of ice cubes. Put your sugar or sweetener in the coffee first, then pour it in the glass with the ice cubes. Nothing is more refreshing! If you have a sweet tooth, you also might want to try a “biberón” (or in some places they call it “bombón”). It’s like a cortado but with condensed milk. I usually ask them to put little condensed milk (less than half the cup), or it gets way too sweet. Note that not all cafés might be able to serve this one, as condensed milk is not available everywhere. 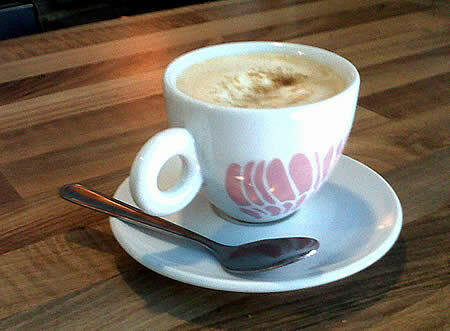 If you need a little booster, “Carajillo” is an expresso with rum, and “Trifàsico” is a carajillo with added milk. Where to get your coffee? A classic in town, Café Zurich in Plaça Catalunya is the place to feel the heartbeat of the city. Not far away, Bracafé in carrer Casp is still frequented by the people from Ràdio Barcelona next door (they also hang out in the nearby Cafè de la Ràdio). If you are in the Boqueria Market, don’t miss a foamy cortado served by Juanitu, from Bar Pinotxo. And near the cathedral, Tostaderos Bon Mercat – in Llibreteria street – is my favorite place. They also roast and sell their own coffee beans. And talking about coffee beans, in Argenteria street there is Cafés el Magnifico (coffee roasters, also serving coffee to go), and Torradors Gispert (known for their roasted nuts, but also selling great coffee beans and other gourmet specialties). Marta Laurent was born in Barcelona and has been a local expert and official tourguide since 2000. She gives private tours for couples, families and small groups, and specialises in the Gaudí sites, but also loves to stroll around the Old Town (Gothic Quarter, Jewish Section…) and was one of the first local guides to give food tours in town. Her tours are a combination of the best sightseeing, a touch of real local life, some fun entertaining stories and lots of tips for the rest of your stay. Thanks for sharing the treats of Barcelona. I am looking forward to enjoying some of them in my upcoming trip, thanks to you, Marta! Preplanned city guides that are developed for first time visitors and are optimized for 1, 3 and 5 days.